Last night at 11:11 pm, I was responding to one of Marys classmates who sent me some high school photos and will be overseeing the memorial committee for their 20 year HS reunion, offering my help. I looked at the clock & told Chad "Look at what time it is". Well, Chad was scrolling through Facebook at that time & told me to come over to where he was quickly. He had just stumbled across a friend request for an 11:11 group! Exactly at 11:11 tonight! Incredible!!! There is something really special about that time.... 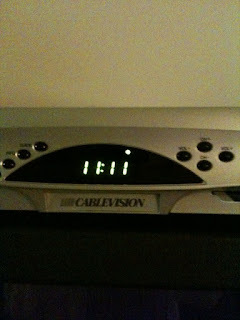 I just thought it was connected to the last time I saw Mary alive 11/11/07, but am learning differently. I will share as I confirm and learn more. Stay tuned!